Made of 22k gold-plated copper or bronze, this smaller interfaith pendant makes a subtle statement about your appreciation for all spiritual paths. 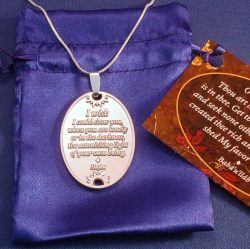 It can be worn by itself, or combined with other charms that express your spiritual path. Symbols represent, clockwise, Bahá’í, Christian, Buddhist, Moslem, Hindu and Jewish Faiths.